Home » Theme Studies » Forgiveness » Forgiveness: Is There Any Other Way? We all make choices – from mildly puzzling ones, like deciding between chocolate mint or praline crunch ice cream, to conscience wrenching ones, like whether we should speak up or stay silent when speaking will cost us dearly. But we probably will never be asked to make a choice that will cost us our lives. We’re usually spared that horror. Jesus wasn’t. In Gethsemane’s garden, Jesus prays in agony: My Father, if this [cup] cannot pass away unless I drink it, your will be done (Matthew 26:42); Father, if it is possible, let this hour pass me by (Mark 14:35); Father, if you are willing, remove this cup from Me; yet not My will, but Thine be done (Luke 22:42). Matthew, Mark, and Luke each pick up different nuances of Jesus’ cry to the Father. Matthew emphasizes Jesus’ active cooperation with His Father’s will: unless I drink it. Mark points us to Jesus’ longing for a less horrific solution to our alienation from God: Is there any other way, any other possibility? Luke and Mark make clear the Father’s will: there is no other way. The Father’s words to Jesus aren’t recorded for our ears, but Jesus hears them and surrenders. He yields … and continues His walk towards this necessary pain. By His scourging we are healed. Healed. Not necessarily from physical infirmities (though that sometimes occurs), but healed from spiritual infirmities that separate us from God – infirmities like deadness and slavery to sin. God sends the penalty for sin away from us … and towards Jesus. By His scourging we are forgiven. What incredible priorities our Lord has. 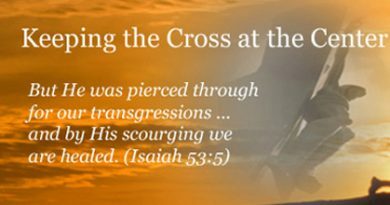 Our forgiveness versus His personal agony? To God, it’s worth every bloody blow. Sin, unpaid for, separates us from God – and God hates to have us distant from Him. He hates it so much that He pays what it costs to bring us near. We are bought with a price, and God finds the price well worth it. He loves our presence. He’s willing to suffer to bring us near. Most of us seriously underestimate how much our Lord – Father, Son, and Spirit – longs to be intimate with us. But if we let Jesus’ Gethsemane choice soak into our awareness, if we let it touch our hearts, we see the intensity of God’s hunger to have us near. In Gethsemane, that hunger fueled each muscle fiber that moved Jesus’ legs towards the cross. I was pondering Gethsemane a while ago, thinking about God’s will and Jesus’ suffering and about God’s will and my suffering – just trying to make sense of it – when some pieces of the puzzle snapped into place. Here’s how I think it all fits together: I think the Father treats us exactly like He treats Jesus. Treats us like He treats Jesus? What’s your gut reaction? Did you get a chill down your spine? Did you imagine God putting you through a Gethsemane horror show of unrestrained, out-of-control, useless pain? Think again – that’s not what Gethsemane signals. Gethsemane has nothing to do with unrestrained, out-of-control, useless pain. Gethsemane shows God’s love. It shows His goodness. And, it also shows that God, when necessary, brings pain. What do love and goodness have to do with pain? They restrain it. And that’s my point. God’s kind of pain produces good that can come no other way. The only pain the Father asked of Jesus was necessary pain. Was there any other way to bring us near? No, there wasn’t. If there were, the Father would not have asked Jesus to suffer. That’s God’s character. He never allows pain if there’s any other way that good can come. God’s love and goodness always restrain and accompany pain. Our Lord treats us like He treats Jesus. He relates to us with the same compassion that He displayed towards His beloved Son. As with Jesus, God allows our pain if (and only if) pain is the only way for good to occur. He allows no suffering in our lives that won’t produce a result, a good result, that can come no other way. There are at times more crucial issues than removing pain. I am not saying that pain is God’s goal or that He in any way enjoys pain. But I am saying that God has good reasons for pain, reasons that go far beyond any earthly suffering. Reasons that often go way beyond our comprehension. Jesus knew what we need to know: pain breaks God’s heart but does not contradict His love. Sometimes good requires pain. Eden required no pain for good to thrive. Heaven needs no pain for good to flourish. Yet, in this fallen world, sometimes the only path to good is through pain. Jesus knew that firsthand. He hated pain but trusted the Father’s heart. We can do the same. I encourage you during this Lenten season to read through at least one of the Gethsemane accounts (You’ll find them in Matthew 26:36-56, Mark 14:32-50, Luke 22:39-53, and John 18:1-12). As you read, and re-read, ask the Spirit open your eyes to see what’s there. What kinds of questions does Jesus ask the Father? What kinds of questions doesn’t He ask? What emotions does He display? What emotions doesn’t He display? Why do you think Jesus is willing to yield to His Father’s will? “In the last paragraph of this post I comment “Sometimes the only path to good is through pain.” What do you think? I also comment, “Pain breaks God’s heart but does not contradict His love.” Do you agree? I am so thankful that none of our pain is in vain. I love that God can take the hurts of my life and use them for good purposes. In the midst of hard times, it can be hard to see with any clarity how God uses it for good. But on the other side, with some perspective, I can see how God has redeemed the painful and even devastating situations in my life to help others who struggle. God has used the pain to build compassion, empathy and humility into this once prideful and self-absorbed girl. While every now and then I wish that God wrote my story differently, mostly I am grateful for all the good that has come from the pain in my life.